The University of Central Arkansas set another fundraising record with its total of $757,939 raised during the fifth annual Day of Giving. During the 24-hour drive Thursday, March 7, a total of 1,386 donors handily raised the record-breaking amount. Donors included alumni, parents, faculty, staff, students and friends, as well as corporate partners who gave to specific funds among the categories of student, campus and community impact. In 2018, UCA raised $434,526 during Day of Giving, and in 2017, UCA raised $41,504. For this year’s Day of Giving, the university enlisted the help of ambassadors. These were about 35 individuals from on and off campus who reached out among their own circles to promote giving during the 24-hour period, Norris said. Several ambassadors focused on a particular fund and sent emails and text messages, created social media campaigns, made personal telephone calls or used other tactics to gather support for Day of Giving. Many departments identified challenge matches that were unlocked for Day of Giving. The following donors pledged a matching challenge to benefit a variety of funds: Terry & Joyce Fiddler (Reynolds Public Appearances); Jeff Standridge (College of Business Advisory Board); Karen Thessing (Computer Science); College of Liberal Arts Dean’s Office – Anonymous, Tom Williams and Peter Mehl (College of Liberal Arts Enhancement); Stephen Addison (College of Natural Sciences and Mathematics); George Bratton (Mathematics); Beth Burgess (Delta Zeta House); Mark Wilson (The Advancement of Undergraduate Research in the Sciences Endowment Fund); Edafio Technology Partners (Conductor); Acxiom (Conductor); Conway Regional (Conductor); and Ray and Phyllis Simon (College of Education). The UCA Student Government Association hosted a centralized donation station inside the Student Center on campus. The first $1,500 of student giving was matched 100 percent, a challenge that was accomplished by 3 p.m. That matching gift will support emergency student scholarships through the Annual Fund. Donations toward student impact funds will provide scholarships to students in financial need and student-athletes, as well as funds for student support services, such as the Bear Essentials Food Pantry and Greek organizations. Campus impact includes funds for faculty and student research projects, as well as service-learning opportunities, scholarships and state-of-the-art equipment. Community impact funds offer experiential opportunities, as well as guest lecturers, first-class exhibits and performances on campus that are available to the larger communities of Conway, Faulkner County and central Arkansas. This includes Reynolds Performance Hall events, Outreach and Community Engagement programs, Arkansas Shakespeare Theatre, and the Conductor, for example. 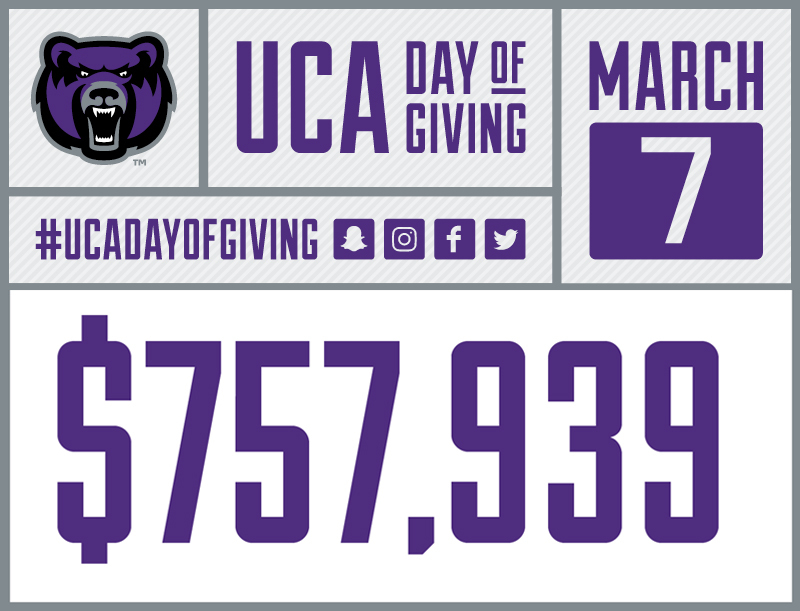 To see more details about the results and the breakdown of individual funds, visit uca.edu/dayofgiving.